When netbooks first came into the market in 2007, the main idea was to offer a low cost computer that could perform basic operations one would perform on a full scale laptop. 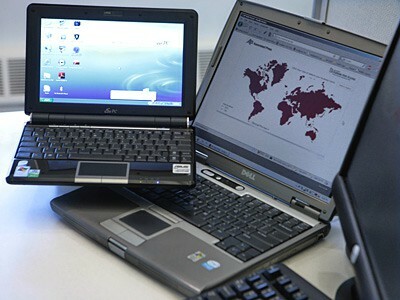 Netbooks are stripped down versions of laptops having a smaller screen, lower memory and come without an optical drive. Netbooks are considered ideal for browsing the internet. The early netbooks had an average screen size of 7 inches and generally came with a 160GB Solid State Drive usually running on either Windows XP or a custom version of Linux. Intel Atom series of processors were released specially for netbooks. A new range of netbooks powered by Intel Atom and similar processors came out. Eventually, better processors came into the market capable of greater speeds and larger displays. After Windows 7 was released in 2009, many netbooks also shipped with pre-installed Windows 7. Netbooks nowadays also have multi-core processors for better execution and generally come with a 1GB RAM (sometimes expandable to 2GB). Some processors are also capable of playing full length HD videos. It’s cheap, and it can do literally anything you could do on a laptop. So why not go for a netbook? Well, here are a few points to consider. Early netbooks shipped generally with either Windows XP or some version of Linux. Nowadays, with processors having modern architectures, netbooks no longer support XP. Most netbooks now run Windows 7. Windows 7 has been tested ideal for netbooks and has good multi-core management capability. However, running programs on a Windows 7 netbook can be a painful and annoying experience. This is due to the fact that a netbook has limited memory and resources. A Windows 7 System with all basic drivers installed (32 bit) occupies about 700MB-800MB of RAM. A typical netbook uses 1GB of physical RAM. Imagine running your favorite programs on less than 200MB of memory. Running multiple programs together on a netbook is a really bad idea. An alternative solution to the memory limitation would be to use Paging and Virtual Memory. However, it is to be noted that netbooks that are “cheap” do not come with Solid State Drives and hence cannot read/write data at high speeds. Thus, using a part of the hard disk as memory won’t work well as data read/write from and to the disk would take considerable amount of time. Note: Many low-end notebooks/laptops are now available in the same (or even lower) price range as netbooks that come with Solid State Drives. Their performance is certainly better than most netbooks. Netbooks running on Linux perform better as Linux has a low memory footprint. But most users don’t like to work on Linux because it is less user-friendly as compared to Windows. Some netbooks also ship with the Android OS, but since it is primarily meant for smartphones, many features like GPS, Auto Rotation, etc. doesn’t work on a netbook. Even if you decide to change your default OS, one major problem you are going to face is the lack of availability of drivers for any alternate platforms. Without the drivers, your netbook might not function at its full potential. For example, Intel GMA series of Graphics Accelerators don’t work properly unless the drivers are installed. Windows 8 is Microsoft’s brand new operating system that is said to utilize memory and CPU resources more efficiently than any other Windows version. The problem is most netbooks won’t be able to run Windows 8 due to several reasons – lack of compatible drivers is one of them. Netbooks support lower screen resolution as compared to laptops. Most netbooks have an optimum resolution of 1024×600, hence, many websites and applications do not display properly on a netbook screen. The Windows Store Apps (previously Metro Apps) featured on Windows 8 don’t run on a typical netbook because a minimum resolution of 1024×768 is required to run them. Internet browsing on a netbook is shaky at best. The memory footprint of even a fast browser like Chrome is huge when compared with the amount of available memory in a typical netbook. Opening multiple tabs slows it down even more. Browsing under such conditions brings down the performance of a network, and you can never utilize the full potential of your internet connection. People buy netbooks are typically for following two reasons – Targeting a low-budget computer, or for portability. Rather than going for a low-budget netbook, it is better to invest some more money and buy a full scale laptop. Though netbooks are good for carrying out basic operations (playing music, browsing, etc. ), for smoother and more productive user experience, you should go for a laptop. For portability, it is recommended that you either go with a Solid State Drive netbook, or a Tablet PC (both of which will cost you more).